It already 6pm. From my house, I look at the sky on the northen side…It was full of black rain cloud….On the southern side at the jetty, the sky is clear…I was thinking…To go or not to go ? It also already too late to jig for fresh tamban. Finnally I decided to go….I grab two small frozen cuttle fish from my freezer which I had caught few weeks ago and headed down. Reach there the tide was coming up. Current was smooth but water just alittle choppy as there is a surface wind blowing from the east. Looking from the jetty…I can see Changi, Pasir ris and Tampinese all the sky was very dark n had lightning striking. But lucky is the wind is coming from the east so it quite safe for now. I set up one set of tackle and cast out a cuttle fish as bait. Few minute later, suddenly the wind change direction….A cold strong wind coming from the north….Ho..ho…I quickly wind back my rod, grab hold of everything and cycle out to the shade outside the jetty. Sited there a few minute and looking at the sky….Haha…the wind stop and those rain cloud starting to flying off…hehe….good…I cycle back and casted out the last cuttle fish. I then setup my squid net and lamp. Around 8.45pm…I just manage to caught two pieces of squid and a small mantis prawn as I prepare to use it for my next bait change. Suddenly….I heard my reel alarm went off. It was just a short scream and stop. I rush over to my rod n the line already abit loose. I strike by running backward….YES…it is ON….The fish make a run…It pull out quite a distance of line and the rod is bend…Then it suddenly turn around….At one point I thought I had lost the fish…I quickly wind back the line then I notice it was swimming inward. By now…I know the fish is not so big but it is definitely not a stingray as by the way it behave. I ask another angler there Desmond to pull up my squid lamp. I told him it is either a kemajan or a cobia. Few minute later after some struggle….I manage to bring the fish to the surface….Hoho….it is a kemajan….I ask another angler WEI MIN to prepare the gaff. By now…the fish is already along side the jetty. I steady the fish and ask WEI MIN to gaff. His first gaff just hook slightly on the side of the fish…It drop down while bringing it up….Hoho…once the fish hit the water…It make a deep dash…Luckily I was holding the rod well….I resurface it again and reposition it for him to try the second gaff…..Again it didn’t gaff well and it drop down again….this time it was near a jetty pillar….The fish almost got away by cutting my line on the pillar. No choice….I had to resurface it again one more time…This time I ask WEI MIN to see properly before he gaff it. He manage to do it well and pull up the fish. I weigh it and it was 5kg. YES….I had added a Shovelnose on my this year list of catches. I had expected it to come on the second half of the year but seem it had arrived early. 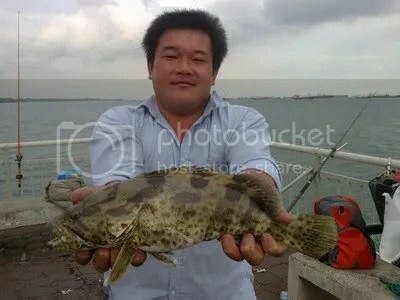 Ah An caught this 1.1kg grouper by a handline lower down below the jetty. Bait was live prawn.